JPMorgan’s latest recession forecast model is up significantly since October, when the largest U.S. bank said the odds of a recession in the next year were 27.6 percent, rising to 60 percent over the next two years. But with the Fed still raising interest rates while the prospect of an all-out trade war with China continues to grow, JPMorgan’s real-time quaint monitor now gives the U.S. a 30 percent chance of recession in the next year — up from just 16 percent last March — and a 70 percent chance of recession in the next two years. The reason for the sharply increased chances of a recession — especially in 2020 — is because that is when President Donald Trump’s Tax Cuts & Jobs Act is expected to run out of steam, going from tailwind to headwind for the economy. To make matters worse, Democrats take control of the House of Representatives in January, meaning there it will be virtually impossible for Trump to pass anymore fiscal stimulus packages. This new information comes on the heels of economist Peter Schiff proclaiming last week that we are already in a recession. Initial jobless claims are among the five most relevant indicators of a coming slump, according to Bank of America economists. 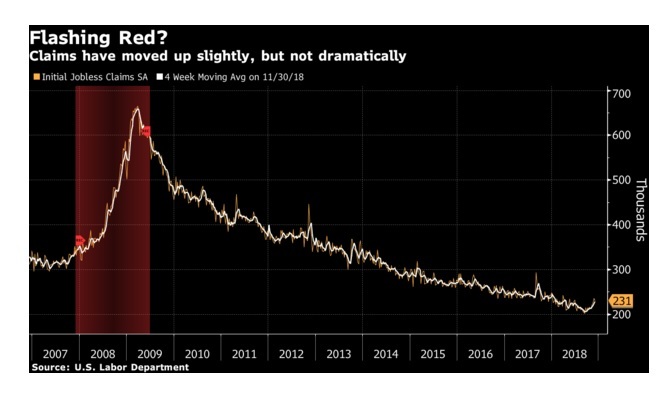 “In the last seven recessions, the 6-month growth rate of initial claims has, on average, jumped double digits heading into the recession,” they wrote. Claims are heading slightly higher on a weekly basis of late, data published Thursday confirmed, but they’ve been at extraordinarily low levels and their recent pop has been relatively small. Friday’s November jobs report also showed that job gains had slowed slightly. Still, unemployment is very low, wage growth is finally above 3 percent, and the participation rate is stable. “We can’t ignore the pickup in claims, but I don’t think it’s a decisive enough shift to conclude that the labor market is slowing in a troubling fashion,” said Michelle Meyer at Bank of America. Bank of America’s other top recession signals are auto sales, industrial production, the Philadelphia Fed index, and aggregate hours worked. Some of those are weakening, but none are falling off a cliff. Meyer said her team’s market-based recession indicator shows a 20 to 30 percent probability of a 2019 downturn, while their gauge based on economic data puts the chance at less than 10 percent over the next 6 months. Business sentiment gauges have softened recently, and that’s one reason for the increase in JP Morgan’s recession-predicting index, which is “getting close to the highest levels of the expansion so far,” analyst Jesse Edgerton says. The cycle peak came in 2016 when growth and markets wavered. 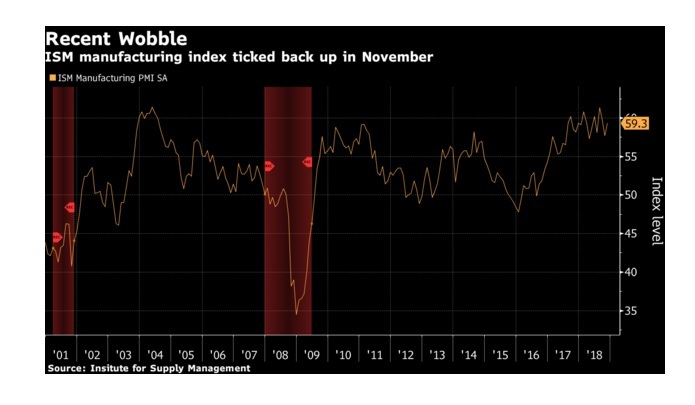 “The risks are drifting toward the economy being softer,” Edgerton says, though he adds that surveys aren’t uniformly weak, and his team still isn’t predicting a 2019 recession. He’ll be focused on high-frequency data, including the regional Fed business reports, for an up-to-date picture of activity. Much ink has been spilled about the recession-predicting magic of a yield curve inversion — a situation in which rates on short-dated debt securities move above those on longer-maturity bonds. The closely-monitored gap between 2-year and 10-year yields has been narrowing, and a less fashionable portion of the yield curve has already inverted. When the yield curve flips, a downturn usually follows. “We hardly have any empirical regularity that’s this regular,” San Francisco Fed President Mary Daly said in a November interview. That said, Fed officials so far don’t sound overly concerned about the curve. They’re monitoring it, but they aren’t willing to focus on it exclusively so long as real economic data hold up. There’s a reason for their reticence. Inversions are a “flawed crystal ball,” UBS Global Wealth Management’s Chief Investment Officer Mark Haefele wrote in a Dec. 5 note. While a flip in the 10-year and 2-year curve preceded each of the past seven recessions, the lag was longer than 24 months on the last two occasions. One of the widest measures of what economists expect, the Fed’s Survey of Professional Forecasters, shows that they’re starting to sour on the economy’s prospects four quarters from now. But their pessimism might be too remote to mean much. The Survey puts the odds that economy will be shrinking in a year’s time at 23 percent. That’s the highest level since 2008 — but it still implies a recession probability of less than 20 percent, according to a Goldman Sachs analysis based on the Survey’s track record. Forecasts are pretty inaccurate that far out, and respondents put a low probability on a recession within the next couple of quarters. In the end, markets and hard data are sending different signals right now. And most economists are sticking with the latter — along with survey numbers — until a more decisive shift becomes obvious. Editor’s note: Are you getting more worried about an impending recession? If so, what are you doing to prepare?